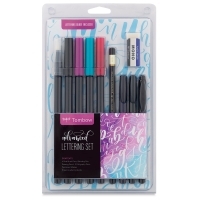 Tombow Lettering Sets offer beginning and advanced hand-letterers everything they need to make their writing beautiful. From lettering and blending to flourishing and embellishing, the included instruction guide offers useful tips to get started and perfect your techniques. 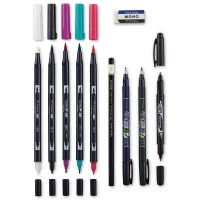 Included in the Tombow Lettering Sets are a variety of pens, markers, and other tools. 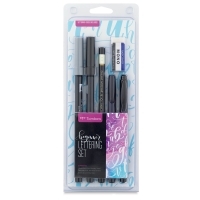 The Tombow Dual Brush Pens have a flexible brush tip for big, bold letters and a fine tip for details. 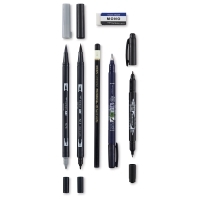 The Fudenosuke Calligraphy pen has a petite brush tip for making smaller letters. The Mono Twin permanent marker features a bullet tip and a fine tip. The Mono drawing pencil is for drawing guidelines, which are easily erased with the Mono eraser after lettering is complete. The colorless blender pen softens and blends colors.